Tagline: One million tons of steel hurtling at 70mph, with 100,000 lives at stakeand 100 minutes to impact. 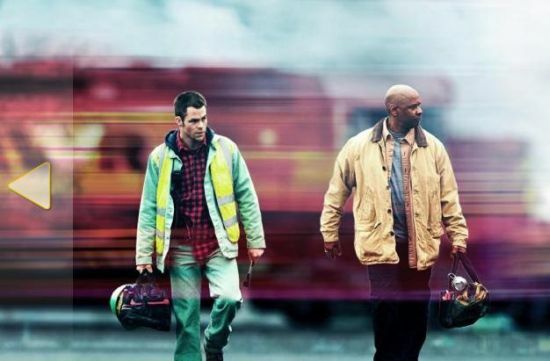 Plot: A runaway train carrying a cargo of toxic chemicals, pits an engineer and his conductor in a race against time to bring it under control before it derails on a curve and causes a toxic spill that will decimate a town. Cindy accompanied me to see this heart stopping film although she would rather have stayed home and watched tv. But once we started watching the movie, she came awake and really was glad we went. I knew practically nothing about the movie except that the trailer I saw promised an exciting few hours, watching a movie on the order of Keanu Reeves' SPEED. This was better by far. Denzel Washington and Chris Pine deliver dynamic performances as the engineer and conductor, respectively, running a locomotive, attempting to catch up with and stop an unmanned, half-mile-long freight train, carrying toxic material, barreling toward a southern Pennsylvania city at 70 miles per hour, where it is bound to be derailed rounding a curve that is only safe at 15 mph. Both men are sure that the derailing will cause disaster to the city in terms of lives lost and millions in damage of property. Ordered by a corporate superior to cease and allow the company to deal with the crisis, both men refuse to follow orders. Convinced that the company's method of dealing with the looming tragedy by derailing it before it reaches the city, will only magnify the oncoming destruction, the engineer and conductor devise their own plan to stop the runaway train before it reaches the dangerous curve. The train chase is played against the background of family problems in the lives of both men. The action is riveting and the acting superb; another hit for Denzel as well as for the supporting cast. Based on a real runaway train incident. On May 15, 2001, a 47-car CSX locomotive left a Toledo, Ohio rail yard without an engineer and wasn't stopped until it had run 66 miles through three counties. No one was injured in the incident. "DRIVING MY YOUNG LIFE AWAY" - Written and Performed by Wayne Hancock, Courtesy of Bloodshot Records. Motion Picture Rating (MPAA) - Rated PG-13 for sequences of action and peril, and some language.